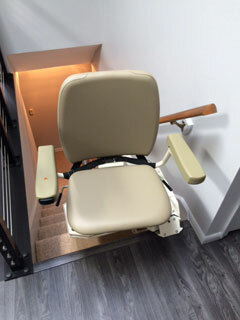 HARMAR is a big company (HARMAR.com) that is a leading manufacturer of not only stairlifts, but also residential elevators, and scooter lifts for cars. Not only made in the USA, but made in Missouri near Kansas City. Simple, sturdy, easy to use design. Slim design folds to 10.5 inches, the most narrow available. 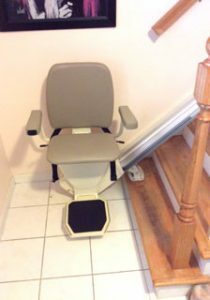 Best stairlift for basement stairs. Clean. NEVER requires grease and continual maintenance like other brands. Legendary reliability. I provide one year of free dealer service. Straight Stairlift at the top of steps. 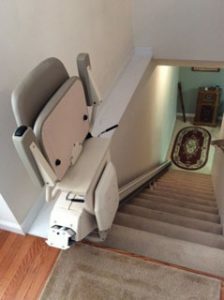 Straight Stairlift folded up at the top of steps. Straight Stairlift at the bottom of steps. 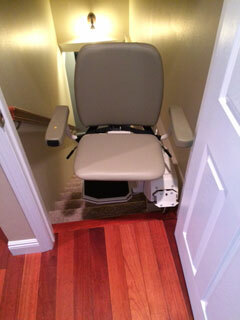 Pinnacle Stairlift at the top of the stairs with basement door. 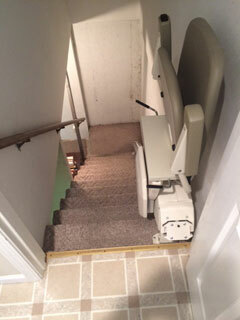 Pinnacle Stairlift folded at the top of the stairs with basement door. 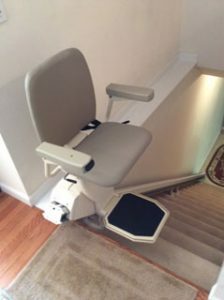 Pinnacle Stairlift turned at the top of the stairs.